There are certain candies that are reserved for holidays like Valentines are chocolate shaped hearts, Halloween is definitely all candies are on the table, Easter are chocolate shaped bunnies and easter eggs. Christmas is synonymous with candy canes. We’ve all eaten them growing up. They dangle from Christmas trees and just begging for us to eat them. Candy canes are just the best candies to eat during Christmas. These peppermint sweetness reminds us of Christmas anytime we eat them. Even Santa Claus hands them out when he visits in the malls. Below are adult candy cane costume ideas for women. Candy Cane Cutie Costume includes a Dress with Red and White Stripped Bodice, a Solid Red Dress with Striped Patterns and Ruffles Along the Hem, a Red Velvet Shurg, Matching Santa Hat, Black Belt and Bows. If he’s craving something sweet, you’re the perfect holiday treat! be irresistible in this candy cane stripe dress with full satin skirt. Includes shrug, belt, Santa hat, and stocking topper bow pins with candy appliques. Click here to get the Christmas Adult Candy Cane Costume. A candy cane dress sealed with a bow. 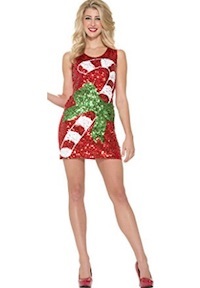 Click here to get the adult Candy Cane miniskirt costume. 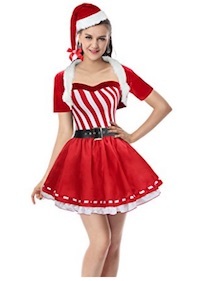 Click here to get the Women’s Candy Cane costume. Beautiful candy cane hooded dress complete with faux fur leg warmers. Click here to get the Candy Cane Mini. Miss Claus costume features a stretch velvet apron dress with gathered bodice, sequin seams and polka dot satin bows with candy cane charm. Stretch metallic candy cane stripe hooded dress is zipper-front and includes a wide belt with silver buckle. Click here to get the Candy Cane hooded dress. Miss candy cane costume includes headband, gloves with attached jingle bell bracelets, boot toppers, and red and white candy striped dress with marabou faux fur trim. Click here to get the Miss Candy Cane Dress.